It was the summer before 4th grade. There wasn’t a cloud in the sky and my family and I were at a minor league baseball game. Not my favorite activity, but hey, what’s an eight year old to do other than tag along? My mama asked me the score of the game and a squinted to read the score board. No dice. You see, my mama is a four eyes and she knew something was up. I remember her saying that it was time for me to visit the optometrist and I remember my heart sinking. How was I supposed to survive 4th grade WITH GLASSES? In 8th grade I entered the grown up world of contacts and proceeded to go through a spell wearing only contacts in high school. In college I became more comfortable with glasses as a needed, but loved accessory and that’s when you start seeing four eye photos of me show up again. Once Dominic came around he started naming my glasses. I had the cheetah glasses, which he still hates to this day and therefore no photos of me exist in them. When ever I wore then, Dom and his brother would make incessant cat sounds – it was too much to handle. The school teacher glasses which were my basic black rim option and my favorite of all, the Sarah Palin’s inspired by none other than the real deal. 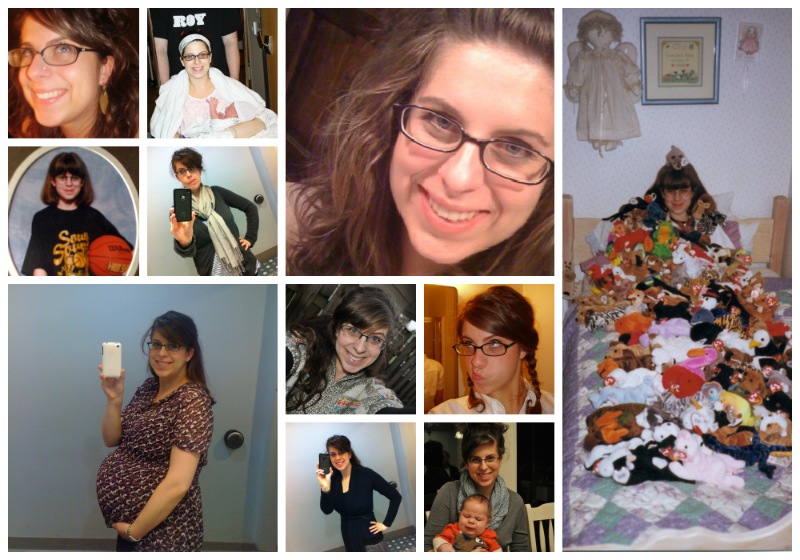 The History of Four Eyes … the only photo that needs an explanation is the one on the far right, because yes, that is a photo of me buried in my Beanie Baby collection #noshame. Oh, and in college it appears I was unable to make eye contact with the camera #oldmyspaceprofilepic. These days, I split my time pretty evenly between prescription glasses and contacts. Glasses on overcast days or days when I’m gonna try to nap with the kiddos and contacts on sunny days (so I can still wear sunglasses). I’ve toyed with the idea of Lasik, but truly, I feel like being a four eyes is part of my identity. It’s not something I want to change. Plus, when it’s Jemma or Max’s turn for glasses (and with our family genes, there is no doubt that day will come) I want them to build their own history of four eyes. This post was sponsored by GlassesUSA.com. If you are in the market to buy glasses, check them out – they have a great assortment of frames and the Virtual Mirror feature (below) is a real treat! I truly appreciate when you choose to support my blog and the sponsors I work with. You’re fabulous! GlassesUSA.com wanted to pass on a little savings to you too! Take 30% off frames [with single-vision Value Lens Package] + FREE shipping (*”premium” frames excluded*). Code: EYECANDY30 or take 10% off any order of prescription glasses. Code: Blog10. I'm getting beaniebaby flash backs… I happened to find a Princess Diana bear in some store the other day, and my heart sank to learn that it was still $5, like it was 15 years ago. Weren't Beanie Babies supposed to fund our college tuition? Should I hold out that they will cover Jemma's? I think they are still in a bin in my parent's storage!